Human iron metabolism is the set of chemical reactions maintaining human homeostasis of iron at both the systemic and cellular level. The control of this necessary but potentially toxic metal is an important part of many aspects of human health and disease. Hematologists have been especially interested in systemic iron metabolism because iron is essential for red blood cells, where most of the human body's iron is contained. Understanding iron metabolism is also important for understanding diseases of iron overload, such as hereditary hemochromatosis, and iron deficiency, such as iron deficiency anemia. The human body needs iron for oxygen transport. Oxygen (O2) is required for the functioning and survival of nearly all cell types (mature erythrocytes being one exception). Oxygen is transported from the lungs to the rest of the body bound to the heme group of hemoglobin in erythrocytes. In muscles cells, iron binds myoglobin, which regulates its release. Most well-nourished people in industrialized countries have 4 to 5 grams of iron in their bodies. Of this, about 6997250000000000000♠2.5 g is contained in the hemoglobin needed to carry oxygen through the blood, and most of the rest (approximately 2 grams in adult men, and somewhat less in women of childbearing age) is contained in ferritin complexes that are present in all cells, but most common in bone marrow, liver, and spleen. The liver's stores of ferritin are the primary physiologic source of reserve iron in the body. The reserves of iron in industrialized countries tend to be lower in children and women of child-bearing age than in men and in the elderly. Women who must use their stores to compensate for iron lost through menstruation, pregnancy or lactation have lower non-hemoglobin body stores, which may consist of 6996500000000000000♠500 mg, or even less. Macrophages of the reticuloendothelial system store iron as part of the process of breaking down and processing hemoglobin from engulfed red blood cells. Iron is also stored as a pigment called hemosiderin which is an ill defined deposit of protein and iron, created by macrophages where excess iron is present, either locally or systemically for example among people with iron overload due to frequent blood cell destruction and transfusions. If the systemic iron overload is corrected, over time the hemosiderin is slowly resorbed by macrophages. Like most mineral nutrients, the majority of the iron absorbed from digested food or supplements is absorbed in the duodenum by enterocytes of the duodenal lining. These cells have special molecules that allow them to move iron into the body. To be absorbed, dietary iron can be absorbed as part of a protein such as heme protein or iron must be in its ferrous Fe2+ form. A ferric reductase enzyme on the enterocytes’ brush border, duodenal cytochrome B (Dcytb), reduces ferric Fe3+ to Fe2+. A protein called divalent metal transporter 1 (DMT1), which can transport several divalent metals across the plasma membrane, then transports iron across the enterocyte’s cell membrane into the cell. Most cell types take up iron primarily through receptor-mediated endocytosis via transferrin receptor 1 (TFR1), transferrin receptor 2 (TFR2) and GAPDH. TFR1 has a 30-fold higher affinity for transferrin-bound iron than TFR2 and thus is the main player in this process. The higher order multifunctional glycolytic enzyme glyceraldehyde-3-phosphate dehydrogenase (GAPDH) also acts as a transferrin receptor. Transferrin-bound ferric iron is recognized by these transferrin receptors, trigering a conformational change that causes endocytosis. Iron then enters the cytoplasm from the endosome via importer DMT1 after being reduced to its ferrous state by a STEAP family reductase. Nutritional deficiency. This can result due to a lack of dietary iron or consumption of foods that inhibit iron absorption, including calcium, phytates and tannins. Black tea steeped for long has high tannins. Inability to absorb iron: A common cause of iron deficiency is the widespread use of acid reducing medications, the strongest of which are proton pump inhibitors (PPIs) such as omeprazole. Iron toxicity results when the amount of circulating iron exceeds the amount of transferrin available to bind it, but the body is able to vigorously regulate its iron uptake. Thus, iron toxicity from ingestion is usually the result of extraordinary circumstances like iron tablet over-consumption  rather than variations in diet. The type of acute toxicity from iron ingestion causes severe mucosal damage in the gastrointestinal tract, among other problems. 1 2 3 Conrad ME, Umbreit JN (Apr 2000). "Disorders of iron metabolism". The New England Journal of Medicine. 342 (17): 1293–4. doi:10.1056/NEJM200004273421716. PMID 10787338. 1 2 Kakhlon O, Cabantchik ZI (2002). "The labile iron pool: characterization, measurement, and participation in cellular processes". Free Radical Biology and Medicine. 33 (8): 1037–1046. doi:10.1016/s0891-5849(02)01006-7. 1 2 Andrews NC (Dec 1999). "Disorders of iron metabolism". The New England Journal of Medicine. 341 (26): 1986–95. doi:10.1056/NEJM199912233412607. PMID 10607817. ↑ Yan Y, Waite-Cusic JG, Kuppusamy P, Yousef AE (Jan 2013). "Intracellular free iron and its potential role in ultrahigh-pressure-induced inactivation of Escherichia coli". Applied and Environmental Microbiology. 79 (2): 722–724. doi:10.1128/aem.02202-12. ↑ Yamamoto Y, Fukui K, Koujin N, Ohya H, Kimura K, Kamio Y (2004). "Regulation of the intracellular free iron pool by Dpr provides oxygen tolerance to Streptococcus mutans.". 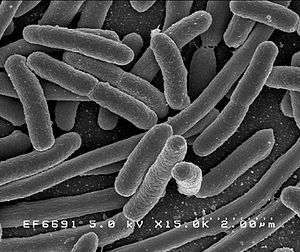 Journal of Bacteriology. 186 (18): 5997–6002. doi:10.1128/jb.186.18.5997-6002.2004. ↑ Ganz T (Aug 2003). "Hepcidin, a key regulator of iron metabolism and mediator of anemia of inflammation". Blood. 102 (3): 783–8. doi:10.1182/blood-2003-03-0672. PMID 12663437. ↑ Camaschella C, Schrier SL (2011-11-07). "Regulation of iron balance". UpToDate. Retrieved 2012-03-11. ↑ McKie AT, Barrow D, Latunde-Dada GO, Rolfs A, Sager G, Mudaly E, Mudaly M, Richardson C, Barlow D, Bomford A, Peters TJ, Raja KB, Shirali S, Hediger MA, Farzaneh F, Simpson RJ (Mar 2001). "An iron-regulated ferric reductase associated with the absorption of dietary iron". Science. 291 (5509): 1755–9. doi:10.1126/science.1057206. PMID 11230685. ↑ Fleming RE, Bacon BR (Apr 2005). "Orchestration of iron homeostasis". The New England Journal of Medicine. 352 (17): 1741–4. doi:10.1056/NEJMp048363. PMID 15858181. ↑ "Iron". Ohio State University Extension Fact Sheet. Ohio State University. Retrieved June 25, 2012. ↑ Kawabata H, Germain RS, Vuong PT, Nakamaki T, Said JW, Koeffler HP (June 2000). "Transferrin receptor 2-alpha supports cell growth both in iron-chelated cultured cells and in vivo". The Journal of Biological Chemistry. 275 (22): 16618–25. doi:10.1074/jbc.M908846199. PMID 10748106. ↑ West AP, Bennett MJ, Sellers VM, Andrews NC, Enns CA, Bjorkman PJ (December 2000). "Comparison of the interactions of transferrin receptor and transferrin receptor 2 with transferrin and the hereditary hemochromatosis protein HFE". The Journal of Biological Chemistry. 275 (49): 38135–8. doi:10.1074/jbc.C000664200. PMID 11027676. ↑ Kumar S, Sheokand N, Mhadeshwar MA, Raje CI, Raje M (Jan 2012). "Characterization of glyceraldehyde-3-phosphate dehydrogenase as a novel transferrin receptor". The International Journal of Biochemistry & Cell Biology. 44 (1): 189–99. doi:10.1016/j.biocel.2011.10.016. PMID 22062951. ↑ Sheokand N, Kumar S, Malhotra H, Tillu V, Raje CI, Raje M (Jun 2013). "Secreted glyceraldehye-3-phosphate dehydrogenase is a multifunctional autocrine transferrin receptor for cellular iron acquisition". Biochimica et Biophysica Acta. 1830 (6): 3816–27. doi:10.1016/j.bbagen.2013.03.019. PMID 23541988. 1 2 3 4 5 6 7 Hentze MW, Muckenthaler MU, Galy B, Camaschella C (Jul 2010). "Two to tango: regulation of Mammalian iron metabolism". Cell. 142 (1): 24–38. doi:10.1016/j.cell.2010.06.028. PMID 20603012. 1 2 Lane, D.J.R. ; Merlot, A.M.; Huang, M.L.-H.; Bae, D.-H.; Jansson, P.J. ; Sahni, S.; Kalinowski, D.S. ; Richardson, D.R. (May 2015). "Cellular iron uptake, trafficking and metabolism: Key molecules and mechanisms and their roles in disease". Biochimica et Biophysica Acta. 1853 (5): 1130–1144. doi:10.1016/j.bbamcr.2015.01.021. 1 2 3 Yehuda S, Mostofsky DI, eds. (2010). Iron Deficiency and Overload From Basic Biology to Clinical Medicine. New York, NY: Humana Press. p. 230. ↑ Finney LA, O'Halloran TV (May 2003). "Transition metal speciation in the cell: insights from the chemistry of metal ion receptors". Science. 300 (5621): 931–6. doi:10.1126/science.1085049. PMID 12738850. ↑ Philpott, Caroline C.; Ryu, Moon-Suhn (22 July 2014). "Special delivery: distributing iron in the cytosol of mammalian cells". Frontiers in Pharmacology. 5. doi:10.3389/fphar.2014.00173. ↑ Arosio P, Levi S (Aug 2002). "Ferritin, iron homeostasis, and oxidative damage". Free Radical Biology & Medicine. 33 (4): 457–63. doi:10.1016/s0891-5849(02)00842-0. PMID 12160928. ↑ Rouault TA, Cooperman S (Sep 2006). "Brain iron metabolism". Seminars in Pediatric Neurology. 13 (3): 142–8. doi:10.1016/j.spen.2006.08.002. PMID 17101452. ↑ Ganz T (Mar 2005). "Cellular iron: ferroportin is the only way out". Cell Metabolism. 1 (3): 155–7. doi:10.1016/j.cmet.2005.02.005. PMID 16054057. ↑ Du F, Qian C, Qian ZM, Wu XM, Xie H, Yung WH, Ke Y (Jun 2011). "Hepcidin directly inhibits transferrin receptor 1 expression in astrocytes via a cyclic AMP-protein kinase A pathway". Glia. 59 (6): 936–45. doi:10.1002/glia.21166. PMID 21438013. ↑ Boradia, Vishant Mahendra; Raje, Manoj; Raje, Chaaya Iyengar (1 December 2014). "Protein moonlighting in iron metabolism: glyceraldehyde-3-phosphate dehydrogenase (GAPDH)". Biochemical Society Transactions. 42 (6): 1796–1801. doi:10.1042/BST20140220. ↑ Sheokand N, Malhotra H, Kumar S, Tillu VA, Chauhan AS, Raje CI, Raje M (Oct 2014). "Moonlighting cell-surface GAPDH recruits apotransferrin to effect iron egress from mammalian cells". Journal of Cell Science. 127 (Pt 19): 4279–91. doi:10.1242/jcs.154005. PMID 25074810. ↑ Kautz L, Jung G, Valore EV, Rivella S, Nemeth E, Ganz T (Jul 2014). "Identification of erythroferrone as an erythroid regulator of iron metabolism". Nature Genetics. 46 (7): 678–84. doi:10.1038/ng.2996. PMC 4104984 . PMID 24880340. ↑ Muckenthaler MU, Galy B, Hentze MW (2008). 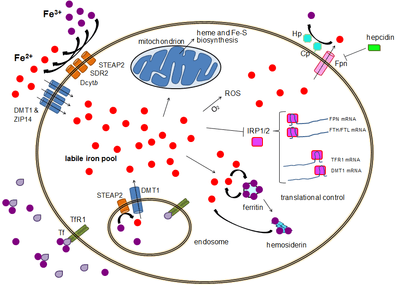 "Systemic iron homeostasis and the iron-responsive element/iron-regulatory protein (IRE/IRP) regulatory network". Annual Review of Nutrition. 28: 197–213. doi:10.1146/annurev.nutr.28.061807.155521. PMID 18489257. ↑ Severyn CJ, Shinde U, Rotwein P (Sep 2009). "Molecular biology, genetics and biochemistry of the repulsive guidance molecule family". The Biochemical Journal. 422 (3): 393–403. doi:10.1042/BJ20090978. PMID 19698085. Andrews NC (May 2004). "Anemia of inflammation: the cytokine-hepcidin link". The Journal of Clinical Investigation. 113 (9): 1251–3. doi:10.1172/JCI21441. PMC 398435 . PMID 15124013. Reilly C (2004). "Iron". The Nutritional Trace Metals. Oxford, UK & Ames, Iowa: Blackwell Publishing. pp. 35–81. ISBN 1-4051-1040-6. Retrieved June 25, 2012.